Are you gluten intolerant but do not want to give up certain delicious flavors? If you are, or if you have to cook for someone who can’t have gluten and you don’t want to give up your favorite tastes, this recipe is perfect for you. Beans are an excellent addition to many traditional dishes in Spain. Legumes are perfect to eat in winter and to make us feel warm. Beans give us energy since they are a good protein source. Those who perform a lot of physical exercise or are still growing should include them in their diet. The fiber in beans prevents the sugar from being absorbed in its majority. Legumes are suitable for diabetics and for those who need to regulate their intestinal transit. Clams are another key ingredient of this dish, which can be eaten at lunch or dinner. Typical of the summer months, they are synonymous with tapas. 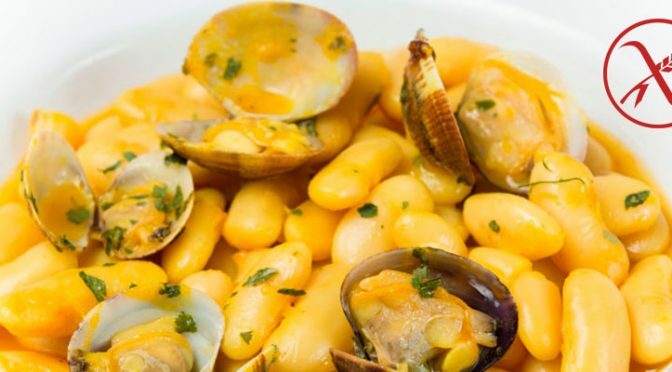 This mollusk is prepared a lot with rice and noodles, but we will give a taste… for the recipe of beans with clams! And it’s gluten free! One day before you make the recipe, you will have to soak the beans. After this essential step, drain and clean the legumes properly in the sink with a very cold stream of water. When you finish, put the beans in an espresso pot, fill it with cold water, and cover them. Add the whole, peeled onion with cloves punctured in it. Wash and peel the carrot. Add it to the pot. Do the same with the green pepper once it is clean and the stalk and seeds have been removed. Let it cook for 25 minutes on low heat, and keep the lid on. Once cooked, we quickly open the pot and let it cool down under the water faucet. This way we’ll lower the pressure. Remove the carrots, onion and pepper to shred them with the help of a blender or a grater. This step is ideal for those who don’t love vegetables, as is often the case with children. Once crushed or shredded, we add them back in with the beans again. Put the pot back on the stove. Season it and then wait for it to boil. Next, wash the clams and dry them well. Throw them in the pot. Clams will open in a maximum of five minutes. When this happens, you have to serve the dish right then so that it doesn’t lose any of its flavor.